Ivor Masters, the General Manager of Stamps for New Zealand Post, today revealed that the stamps will be released in May, marking the Queen’s Diamond Jubilee. “We’re still finalising the details and designs of these stamps,” Ivor Masters said. “However given the high level of public interest in how the Queen is portrayed on New Zealand’s banknotes and stamps, we’ve chosen to share two of the images which will feature on those stamps. “Queen Elizabeth last featured on New Zealand stamps in 2007, marking the 60th anniversary of her wedding to Prince Philip, the Duke of Edinburgh. On that occasion our stamps pictured the couple on their wedding day and in an official Diamond Wedding Anniversary portrait. “This year we’re taking a similar ‘Then and Now’ approach. One of the Jubilee stamps shows Queen Elizabeth in 1953 delivering her Christmas message from Government House in Auckland. This is only time the Queen has delivered her Christmas message outside the UK. Another Jubilee stamp will be based on the official portrait of Her Majesty Queen Elizabeth II taken by London-based photographer Julian Calder. The official Jubilee image has HM Queen Elizabeth II wearing the Sovereign's insignia of the Order of New Zealand, the New Zealand Order of Merit, Star, Sash and Badge and the Queen's Service Order. “Seeing these two images side-by-side is a stirring reminder of the Queen’s close links and emotional connection to New Zealand over the past six decades,” Ivor Masters says. “Most of us, myself included, have known no other monarch in our lifetimes. Her Majesty’s reign continues to serve as an enduring symbol of consistency and tradition for generations of New Zealanders. “When Elizabeth acceded to the throne in 1952 New Zealand’s population was less than half of what it is today. In 1952 Yvette Williams became the first Kiwi woman to win an Olympic medal – while a future history making woman – future first female Prime Minister Jenny Shipley – was a newborn. The All Blacks, captained by Kevin Skinner and with the legendary Ron Jarden playing left wing, played just two tests that year – compared to the 14 scheduled for 2012. “The world has clearly changed in innumerable ways during the Queen’s reign to date, and we are pleased to be able to celebrate this Diamond Jubilee by creating these stamps,” Ivor Masters says. 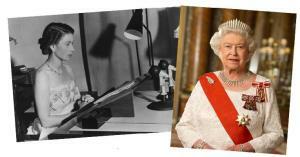 The Queen’s Jubilee stamps will be released in May 2012. 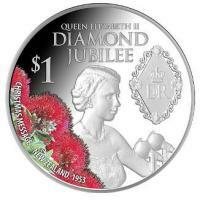 Last month New Zealand Post released a 1oz silver proof commemorative coin for the Queen’s Diamond Jubilee - the only New Zealand legal tender commemorative coin to celebrate the 60th anniversary of the accession of Her Majesty to the throne. The coin is now available through selected New Zealand PostShop stores, at REAL Aotearoa stores in Auckland and Wellington, online at www.nzcoins.co.nz or by phoning 0800 NZ COINS (0800 692 646).